With their huge experience and expertise, Monin has created a number of high quality Syrups, Coulis and other Smoothies. At MaxiCoffee, we've selected the best Monin Syrups, Smoothies, Toppings and Frappé drinks for individuals and professionals. 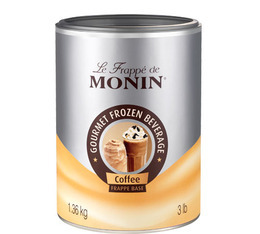 With this coffee-flavoured powder from Monin, you will be able to make a delicious Frappé coffee at home. Ideal used in a blender or shaker. 1.36kg box.